This article will show you how you can use ES modules in the browser today. One common solution is to load arbitrary scripts in a web page using <script> tags. However, this brings its own problems. For example, each script initiates a render-blocking HTTP request, which can make JS-heavy pages feel sluggish and slow. Dependency management also becomes complicated, as load order matters. ES6 (ES2015) went some way to addressing this situation by introducing a single, native module standard. (You can read more about ES6 modules here.) However, as browser support for ES6 modules was initially poor, people started using module loaders to bundle dependencies into a single ES5 cross-browser compatible file. This process introduces its own issues and degree of complexity. But good news is at hand. Browser support is getting ever better, so let’s look at how you can use ES6 modules in today’s browsers. Safari, Chrome, Firefox and Edge all support the ES6 Modules import syntax. Here’s what they look like. Simply add type="module" to your script tags and the browser will load them as ES Modules. 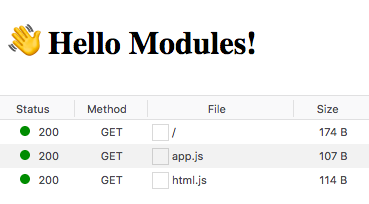 The browser will follow all import paths, downloading and executing each module only once. You’ll need a server to be able to fetch with import, as it doesn’t work on the file:// protocol. You can use npx serve to start up a server in the current directory for testing locally. If you’re bold enough to try this in production today, you’ll still need to create separate bundles for older browsers. There’s a polyfill available at browser-es-module-loader which is following the spec. However, this isn’t recommended for production at all. Don’t throw away your build tools like Babel and Webpack just yet, as browsers are still implementing ways to optimize fetching. Still, there are performance pitfalls and gains to be had in the future with ES Modules. HTTP2 is capable of pushing multiple resources in a single response compared to HTTP1.1, which can only deliver one. This will help keep the number of round trips over the network to a minimum. Delivering multiple smaller ES modules may benefit caching as the browser will only need to fetch the ones that have changed. The problem with producing large bundles is that if you change one line, you invalidate the whole bundle. ES modules are not render blocking by default, like <script defer>. If your modules don’t need to be executed in the same order they are defined in the HTML, you can also add async to execute them as soon as they’re downloaded. Popular libraries are starting to be published as ES modules now, however they’re still targeting bundlers and not direct imports. This is just an example to demonstrate that lodash-es is not built to be loaded directly in the browser yet. To do that, you’ll still need to create your own bundle with ES modules as the target. As the following table shows, browser support for ES modules is good (and getting better all the time). Can I Use es6-module? Data on support for the es6-module feature across the major browsers from caniuse.com. The time to start experimenting with ES modules in the browser is now. Soon enough, you’ll be able to use them in all modern browsers without a transpiler or bundler, should you wish.